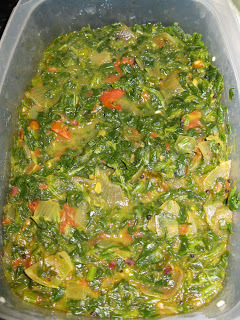 Well friends, I made this side dish last week using the left over Tomato godhsu and cooked plain spinach. I made spinach kootu with the frozen spinach. I just used half the box of spinach and kept the other half. 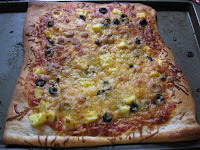 I used it for this dish along with the tomato godhsu I made for breakfast. Here goes the recipe. Jackfruit Paste:- First pressure cook the jackfruit pieces upto one whislte. Let it cool and grind it into a fine paste. If you are going to make the payasam immediately, then measure how much paste you have and take jaggery according to the ratio of 1:1 (equal amount). I made this paste on tuesday and I refrigerated this paste in an air tight container. I used it today. When you are ready with the paste, just take equal amount of jaggery and keep it aside. 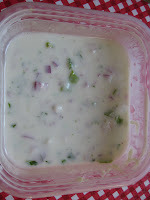 Take a heavy bottomed pan, put the paste first and add 1/4 cup water to it and let it melt first. 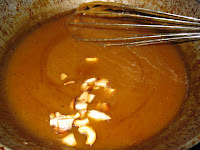 Once the paste becomes watery, add the jaggery to it and mix it well and let it boil under low flame for another 7 mts. You can see bubbles coming out. Now its time to add coconut milk or regualr milk and mix it with the ingredients and let it boil for another couple of mts. You can smell the jackfruit, jaggery and coconut. Its means payasam is ready. Now take a small pan, pre heat ghee, fry coconut pieces and cashews to golden brown and pour it on top of paysam and mix it well. 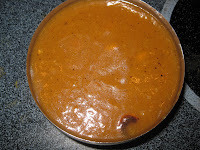 Don't forget to keep on stirring the payasam otherwise jaggery will stick in to your pan. I used regular full fat milk instead of coconut milk. Also we can add more ghee in between too. I didn't add that much ghee. I just used 2 tbsp (which is too much for my hubby dear). 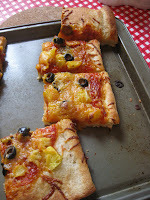 We can also use a lot of coconut pieces which i reduced because of my husband. Pre heat Oven for 450 degrees. Spray a cookie sheet with oil. 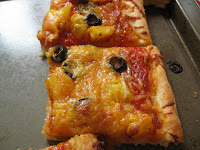 Roll the pizza dough, spread the pasta sauce, arrange the toppings accordingly, spread the cheese, bake it in the oven for 13 mts or till the edges become brown. Enjoy.. Since I didn't want to discourage my girls to try. I am really happy that my girls tried something and it came out really well.